Barcelona is surrounded by wine-producing areas, all of them quite close to the city. 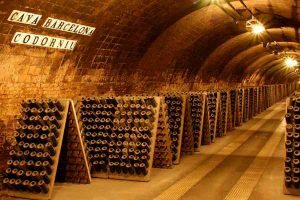 To the west, in Vilafranca del Penedès and Sant Sadurní d’Anoia, there are the caves, where the sparkling wine with the same name (cava) is produced. To the northeast, the small town of Alella is home to a DO with a great variety of grapes, and further, to the northwest, the Pla de Bages DO vineyards are found, along the Llobregat river. From family-run wineries to big companies, they all carry on with this long-established tradition. 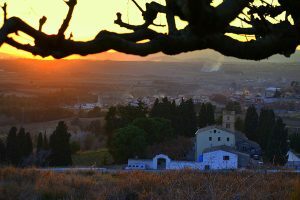 Whether the Penedès or Alella, they can both be great one-day trips to move away from the bustle of the city. Just a one-hour drive or train trip from Barcelona, the Penedès is a comarca (two, in fact: Alt Penedès and Baix Penedès -High and Low, respectively) located in one of the oldest wine-producing areas in Europe, that also includes other comarques (small administrative and historical regions), like l’Anoia, el Baix Llobregat and El Garraf), with countless vineyards producing wines and caves. Visits can be scheduled in many of them. Vilafranca, a town just one hour from Barcelona has a tourism website that offers a list of wineries and vineyards with their contact details, which will allow you to plan your visit. In the historical centre of this town you will also find Vinseum, the Museum of Wine Cultures in Catalonia, located in an old royal palace from the 13th century. The CIC Fassina (Cava Interpretation Centre) is located in Sant Sadurní d’Anoia, that can also be accessed by train. Located in an old distillery built in 1814, it offers a 1,200-square-metre showroom devoted to the world of cava. 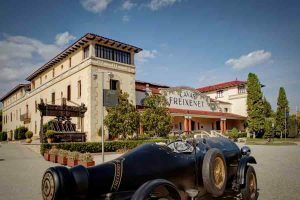 The Freixetren offers a combined ticket: train + visit to Caves Freixenet. Caves Codorniu also have several “experiences”, and among them, a combined ticket to Montserrat, leaving from Plaça Catalunya in Barcelona. In Barcelona’s Tourism Website, there are several excursions in the aforementioned comarques, like cycling enotourism routes in family-run vineyards that include breakfast. Wine Tourism Spain‘s website also offers packages for visiting wineries in the Penedès. Located in a rather hilly area of the Maresme coast, 2km from the sea and 18km from Barcelona, the DO Alella produces mostly white wines, from the vineyards growing on its sandy soils. Alella’s City Council’s website offers different packages and options, from a helicopter ride over the vineyards, to private tours including gastronomical experience in a winery and a shopping afternoon in La Roca Village, to enology-related activities for children. Also, Barcelona’s Tourism website offers the possibility of a tour, this time with an e-bicycle, to discover Alella’s vineyards. And if you have no time to leave Barcelona, you can always visit the lookout at the Columbus Monument, and taste some cava and wine varieties, all of them with DO from Catalonia. Discover Barcelona with Premium Suite Hotels. Choose the one that best suits your needs and enjoy the comfort of an apartment with hotel services. AKO SUITE ****: Elegant and minimalist boutique hotel, next to Plaza Cataluña and Paseo de Gracia. ACACIA SUITE ****: Near Hospital Clínic and Diagonal. Good connection to the Ave Station in Sants and the El Prat airport. BONANOVA SUITE ***: A classic hotel in the quiet and residential neighborhood of Sarrià-Sant Gervasi. Very close to the prestigious Teknon and IMO hospitals. ABARCO APARTMENTS: In a natural and urban environment in the quiet town of Santa Coloma de Gramenet, 30 minutes from the center of Barcelona.